Dominion Resources CEO Tom Farrell is famously bullish on nuclear energy as a clean solution in a carbon-constrained economy, but he’s got it wrong. Nuclear is a barrier to a clean-energy future, not a piece of it. That’s only partly because new nuclear is so expensive that there’s little room left in a utility budget to build wind and solar. A more fundamental problem is that when nuclear is part of the energy mix, high levels of wind and solar become harder to achieve. To understand why, consider the typical demand curve for electricity in the Mid-Atlantic, including Virginia. Demand can be almost twice as high at 5 p.m. as it is at 5 a.m., especially on a hot summer day with air conditioners running. 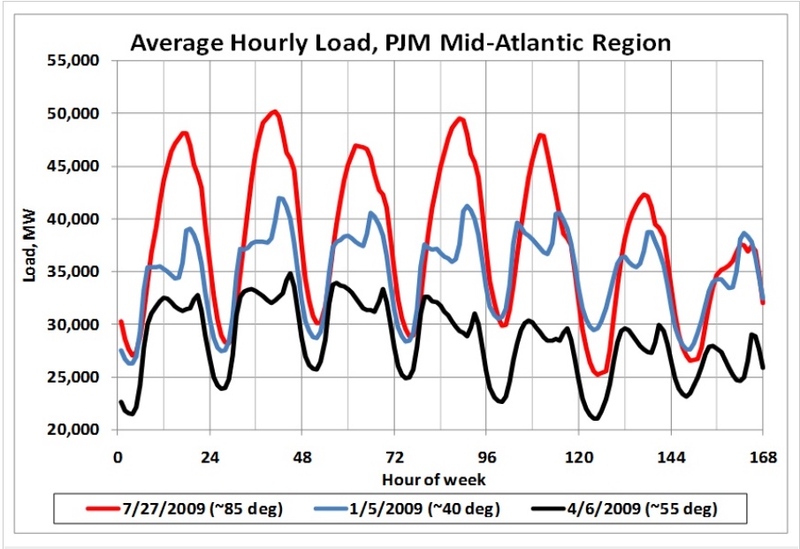 Average hourly load over a one-week period in January, April and July 2009. Credit B. Posner. The supply of electricity delivered by the grid at any moment has to exactly match the demand: no more and no less. More than any other kind of generating plant, though, the standard nuclear reactor is inflexible in its output. It generates the same amount of electricity day in and day out. This means nuclear can’t be used to supply more than the minimum demand level, known as baseload. In the absence of energy storage, other fuel sources that can be ramped up or down as needed have to fill in above baseload. Wind and solar have the opposite problem: instead of producing the same amount of electricity 24/7, their output varies with the weather and time of day. If you build a lot of wind turbines and want to use all the electricity they generate (much of it at night), some of it will compete to supply the baseload. Although solar panels produce during daylight when demand is higher, if you build enough solar you will eventually have to cut back on your baseload sources, too. With enough energy storage, of course, baseload generating sources can be made flexible, and wind and solar made firm. Storage adds to cost and environmental footprint, though, so it is not a panacea. That said, Virginia is lucky enough to have one of the largest pumped storage facilities in the country, located in Bath County. Currently Dominion uses its 1,800 MW share of the facility as a relatively low-cost way to meet some peak demand with baseload sources like coal and nuclear, but it could as easily be used to store electricity from wind and solar, at the same added cost. Without a lot of storage, it’s much harder to keep wind and solar from competing with nuclear or other baseload sources. You could curtail production of your wind turbines or solar panels, but since these have no fuel cost, you’d be throwing away free energy. Once you’ve built wind farms and solar projects, it makes no sense not to use all the electricity they can produce. But if nuclear hogs the baseload, by definition there will be times when there is no load left for other sources to meet. Those times will often be at night, when wind turbines produce the most electricity. The problem of nuclear competing with wind and solar has gotten little or no attention in the U.S., where renewables still make up only a small fraction of most states’ energy mixes. However, at an October 27 workshop about Germany’s experience with large-scale integration of renewable energy into the grid, sponsored by the American Council on Renewable Energy, Patrick Graichen of the German firm Agora Energiewende pointed to this problem in explaining why his organization is not sorry the country is closing nuclear plants at the same time it pursues ambitious renewable energy targets. Nuclear, he said, just makes it harder. How big a problem is this likely to be in the U.S.? Certainly there is not enough nuclear in the PJM Interconnection grid as a whole to hog all the baseload in the region, and PJM has concluded it can already integrate up to 30% renewable energy without affecting reliability. But the interplay of nuclear and renewables is already shaping utility strategies. Dominion Virginia Power is on a campaign to build out enough generation in Virginia to eliminate its imports of electricity from out of state. And in Virginia, nuclear makes up nearly 40% of Dominion’s generation portfolio. Now Dominion wants to add a third nuclear reactor at its North Anna site, to bring the number of its reactors in Virginia to five. If the company also succeeds in extending the life of its existing reactors, the combination would leave precious little room for any other energy resource that produces power when demand is low. That affects coal, which is primarily a baseload resource. It would also impact combined-cycle natural gas plants, which are more flexible than coal or nuclear but still run most efficiently as baseload. But the greatest impact is on our potential for renewables. This desire to keep high levels of nuclear in its mix explains Dominion’s lack of interest in land-based wind power, which produces mostly at night and therefore competes with nuclear as a baseload source. Dominion’s latest Integrated Resource Plan pretty much dismisses wind, assigning it a low value and a strangely high price tag in an effort to make it look like an unappealing option. Dominion shows more interest in solar as a daytime source that fills in some of the demand curve above baseload. But given Dominion’s commitment to nuclear, its appetite for Virginia solar is likely to be limited. Already it insists that every bit of solar must be backed up with new natural gas combustion turbines, which are highly flexible but less efficient, more expensive and more polluting than combined-cycle gas, and add both cost and fuel-price risk. Dominion’s seeming insistence that solar must be paired with gas to turn it into something akin to a baseload source is plainly absurd. It seems to be an effort to increase the cost of solar, part of an attempt to improve the company’s prospects of getting the North Anna 3 nuclear reactor approved in the face of its dismal economics. Good resource planning would consider all existing and potential sources together, including using the existing pumped storage capacity in the way that makes most sense. We already know that North Anna 3 would be breathtakingly expensive. Evaluating it in the full context of other supply options will show it is even worse than Dominion acknowledges. Dominion’s campaign to isolate Virginia’s power supply from the larger PJM grid also does a disservice to ratepayers. Keeping generation local benefits grid security when the generation is small-scale and distributed, but not when it’s a huge nuclear reactor sited on a fault line right next to two others. Otherwise, there is nothing wrong with importing power from other states. These are not hostile foreign nations. Pennsylvania is not going to cut us off if we don’t release their political prisoners. In truth, it seems to be Tom Farrell’s plan to secure Dominion’s profitability for decades to come by walling off Virginia into a corporate fiefdom and controlling the means of production within it, like some retrograde Soviet republic. Utility customers, on the other hand, benefit much more from having our grid interconnected with PJM and the thousands of other power sources that help balance load and ensure reliability. One can only hope that Dominion’s regulators at the State Corporation Commission will see that. Over the course of the next couple of decades, Virginia, like the rest of the U.S.—and indeed, the rest of the world—has to transition to an electricity supply that is almost entirely emissions-free. Very little planning has gone into making this happen, but several studies have shown it can be done. The Solutions Project offers a broad-brush look at how Virginia can combine onshore wind, offshore wind, solar and small amounts of other sources to reach a 100% clean energy future. Other researchers have done the same for PJM as a whole. No doubt this will be a long and challenging journey, but the path we start out on should be the one most likely to get us to our goal. Nuclear seems likely to prove a stumbling block along the way, and an expensive one at that. Certainly, we shouldn’t make the problem worse. According to the article, some U.S. utilities are looking to tackle the challenge rather than retire their nuclear plants. These are nuclear plant owners that have to bid power into the wholesale market, where a nuclear plant, with its fixed operating costs, can’t compete with low-cost natural gas and renewable energy, especially at night. But of course, if you run a high-cost plant for fewer hours of the day, the average cost per kilowatt-hour increases. Dominion doesn’t have to bid its nuclear into a wholesale market, so it has no incentive to try to run its plants flexibly. And given the astoundingly high cost of North Anna 3, curtailing its operation, and increasing the cost per kilowatt-hour produced, would be out of the question.